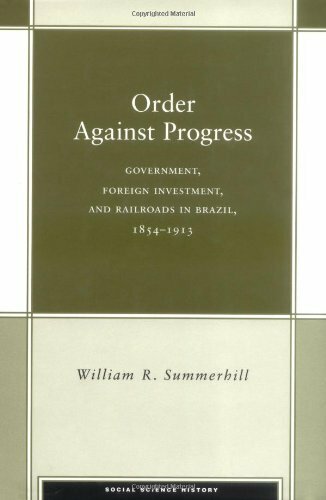 Order Against Progress (Stanford University Press, 2003), is now available in Portuguese as Trilhos do Desenvolvimento (Ed. Livros de Safra). [Ebook at amazon.com.br and at amazon.com}. 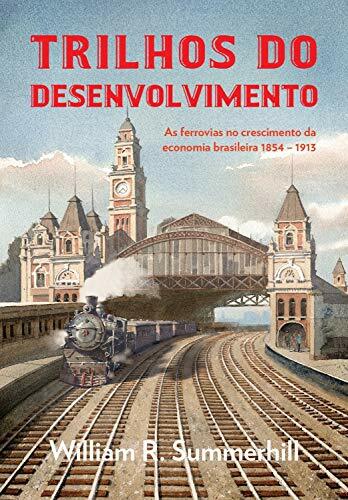 Investments in railroads in the second half of the nineteenth century were the single most important factor in Brazil's transition from relative economic stagnation to growth around 1900. Railroads provided large savings on transport costs, releasing scarce resources for other sectors of the economy. The government's policy of contingent subsidy mobilized capital to build railroad lines, attracting investment within Brazil and from abroad. While this provided investors with a relatively secure return, the government's regulation of rates capped the profits of foreign companies, and captured most of the economic surplus from lower-cost transport for Brazil. The Brazilian edition is made possible by the initiative and generous support of Guilherme Quintella. It offers findings from quantitative economic history that bear directly on discussions of the future of infrastructure policy and sorely-needed investments in Brazil. Elio Gaspari note on Trilhos do Desenvolvimento in Folha de S.Paulo and O Globo (September 2018); Marcelo Toledo review of Trilhos do Desenvolvimento (October 2018) and blog post (August 2018), in Folha de S.Paulo; Samuel Pessôa, "Trilhos do Desenvolvimento: nosso subdesenvolvimento tem sido construído por nós mesmos, não por gringos," in Folha de S.Paulo (August 2018); interview with João Soares in Deutsch Welle (Brasil), “Brasil hoje não tem posição no mercado que tinha no século 19,” (September 2018); interview with Gustavo Altman for JOTA (November, 2018). Presentation on Trilhos do Desenvolvimento at Tribunal de Contas da União (TCU) (Brasília) [with participation by Júlio Marcelo de Oliveira, prosecutor from the Ministério Público; Carlos Pio, Secretaria de Assuntos Estratégicos da Presidência da República; and Fernando Camargo, head of the TCU's Initiative on Efficiency and Productivity]. Government debt crises are a fact of political and economic life. By the middle of the 19th century most Latin American states had become what modern scholars have labeled "serial defaulters." Inglorious Revolution shows that Imperial Brazil (1822-1889) was a key exception. The political institutions of constitutional monarchy provided an effective penalty for default in Brazil, much as they had done with Britain’s Glorious Revolution more than a century before. This credibly committed the government to repay its debts. Beginning in the 1820s bankers in London structured Brazil's loans in sterling, while Rio de Janeiro's merchants and slave traders made loans in local currency. Since parliament always budgeted funds to service the debt, Brazil's bondholders on both sides of the Atlantic always received their interest payments. The result was continuous access to capital markets. This achievement constituted nothing less than a revolution in public finance. Given Imperial Brazil's enviable record of government borrowing, one would expect it to undergo a broad-based revolution in private finance. This study shows it did not. Restrictive and arbitrary controls over incorporation, and regulatory barriers to entry by banks, created financial underdevelopment. The same political institutions that fostered credible public finance stymied innovation in private capital markets. In terms of their consequences for financial development, Imperial Brazil's political institutions produced an inglorious revolution. 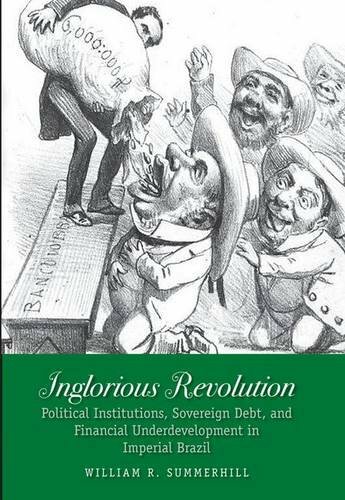 Research on sovereign debt: Inglorious Revolution highlighted by Elio Gaspari in the Folha de S.Paulo and O Globo (2016); José Augusto Ribas Miranda, "Por que o Brasil não teve uma Wall Street?" (2018); Ulisses Ruiz-de-Gamboa ["Como era solvente meu Império"] in Diário do Comércio (March 2016); Asher Levine, "What a 19th Century Default Says About Brazil's Crisis Today," in Americas Quarterly; Jorge Felix in Valor Econômico, "Lições da história econômica;" Fabio de Castro, "Quem não deve não tem crédito"
On the gravity of the economic problem that Brazilians face, read Mansueto de Almeida Jr., Marcos de Barros Lisboa, and Samuel de Abreu Pessôa, O Ajuste Inevitável (2015), read this summary, and watch this interview with the authors (in Portuguese; brief summary in English here). On fiscal dominance and the highest interest rate in the world see Gustavo Franco, "Moeda e dominância fiscal" (2015). For the origins of current crisis, read the Insper working paper by Marcos Lisboa and Zeina Abdel Latif, Democracy and Growth in Brazil (2013) [Casa das Garças conference version here], and an interview on the role of businesses in creating the crisis ("Empresários também tem culpa"). For a visionary perspective on the difficult reforms that will be required: Marcos Lisboa and Samuel Pessôa, "As meias-entradas no caminho do ajuste econômico" in Folha de S.Paulo (2016). On what is necessary to overcome decades of productivity stagnation, read João Manoel Pinho de Mello’s “Productivity as the Key to Sustainable Growth in Brazil,” and Pedro Cavalcanti Ferreira and Renato Fragelli Cardoso, “Produtividade, eficiência, e atraso” in Valor (2018). For how Brazil works: Bruno Carazza's indispensable book, Dinheiro, Eleições e Poder (2018). William Summerhill is Professor of History, and the Dr. E. Bradford Burns Chair in Latin American Studies at UCLA. He received his PhD in History from Stanford. Most of his research concerns Brazil's economic history, including the political economy of sovereign debt, banking and finance, railroads and the provision of infrastructure, and inequality. He collaborates with Samuel de Abreu Pessôa and Edmilson Varejão (FGV) in a project on the economic impact of education and education policy in twentieth-century Brazil; with Renato Perim Colistete (FEA-USP) [no Bial] on workshop activities in Brazil; and with Leonardo Monasterio (IPEA) in a big-data, group project on long-run social mobility in Brazil. Before (and occasionally after) taking up an academic career he served in the United States Army (my gen here).